2018 is here and with a new year comes new trends in hardwood flooring. 2018 is here and with a new year comes new trends in hardwood flooring. There are many new trends this year with regards to shades, materials, layouts, and finishes. Here are just a couple of the hardwood flooring trends we expect to see in 2018. Despite the fact that darker hardwood can sometimes be a challenge to keep clean, the trend toward darker hardwoods that we’ve seen for the last several years continues to grow. Homeowners who prefer darker hardwood have been leaning more towards the cooler shades and staying away from anything with a red undertone. If you’d like to go darker with your hardwood but save yourself a bit of the maintenance involved in darker flooring, try dark walnut, antique brown, coffee brown, or special walnut. On the other end of the color spectrum, lots of homeowners are also going for a lighter, more natural look. However, the trend towards cooler tones remains here as well. Lighter hardwood is the second most popular color for hardwood flooring. Homeowners seem to be moving towards a simpler layout for their floors. Many are asking for single-width planks laid in a single direction. Herringbone, multiple widths, borders, diagonals, chevron, and other layouts are being left behind in favor of simpler flooring choices. The simple, clean look is growing in popularity, as other options tend to be busy and distracting. Wider plank flooring can make your space look larger. Wide planks can make an older home look more authentic, and a newer home look more modern. 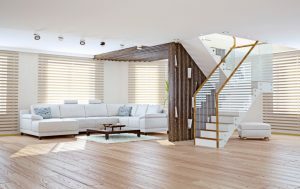 In the last several years, new installations with planks smaller than 3 1/4” have been decreasing dramatically, and that trend is expected to continue. This entry was posted on Wednesday, January 24th, 2018 at 1:20 pm. Both comments and pings are currently closed.